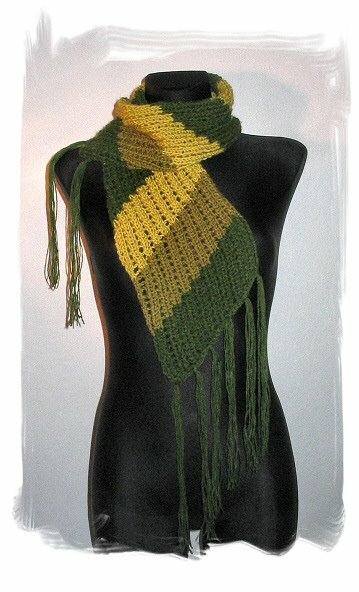 This scarf really suprised me during making because it started to slant from the very beginning! But that's just the nature of the pattern. If you want a fringe, cut the appropriate number of 24" strands in a chosen colour and set aside. Repeat these two rows 9 times for one colour, then switch to another shade of green - repeat 9 times, and to the third shade of green - repeat 9 times. And so on. Knit till you desire or run out of yarn. Mine is 19 cm/7,5 in wide and 115 cm/46 in long.